Hubble has a new supernova discovery to its credit. This one is dubbed SN 2013ek. 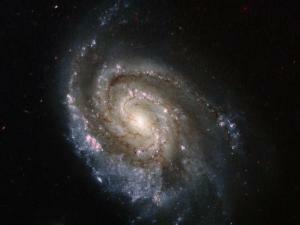 Another supernova was discovered in this same galaxy last year, and very close to the same spot as this new one. Which is raising a few eyebrows. Indeed they believe these two events could be linked. The nova is the bright starlike object just above and to the right of the bright galactic nucleus. The other objects in that galaxy that look similar are likely knots of young stars, or large globular clusters, that are fairly commonly found in galaxies, even our own. My only regret is this object is so far south from my location I won’t be able to turn a telescope in its direction to see if I can spot it. This entry was tagged Advancing Technology, Discovery, Hubble, Science, Supernova. Bookmark the permalink. ← It Took Science To Prove This?